Mazda officially unveiled the fourth generation MX-5 (ND) on September 3, 2014 in the United States and Spain (September 4, 2014 in Japan). 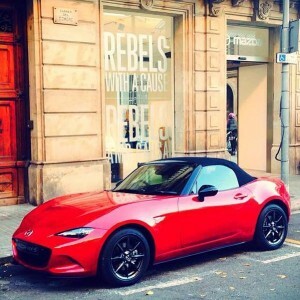 The new MX-5 was presented at the October 2014 Paris Motor Show, and at the November 2014 Los Angeles Auto Show. The car is manufactured in Mazda’s Hiroshima plant. The vehicle was released in the third quarter of 2015. 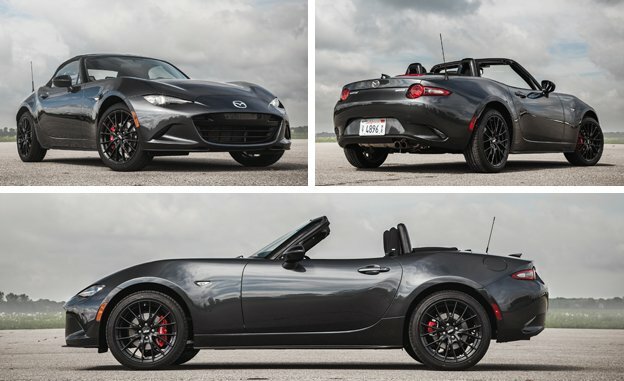 The MX-5 is priced between $24,915 and $30,065. 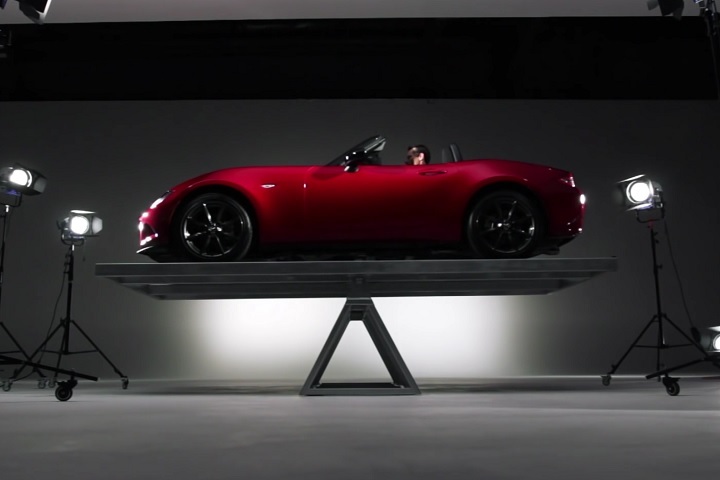 The fourth generation MX-5 is 105 mm (4 inches) shorter and 100 kg (220 lb) lighter than its predecessor, putting the vehicle’s estimated curb weight somewhere around just 1,000 kg (2,200 lb). The car is based on the Mazda SKYACTIV technology. There are 2 direct-injection petrol engines without turbo-chargers. The base model has a 1.5 L 96 kW (129 bhp) engine, and the North American (USA and Canada) version has a 2.0 L 116 kW (155 bhp) engine. A six-speed manual shift transmission was available from launch but a six-speed automatic transmission will be offered when the RF (Retractable Fastback) model becomes available late 2016 / early 2017. The cockpit, steering wheel, and infotainment system are very similar to the 2014 Mazda3. Standard models come with a manually operated fabric roof which can be opened/closed within a few seconds, but the RF model comes with a targa-like electric lid, which can open at speeds of up to 6 mph (10 km/h) and leaves the roof’s coupe-like rear section in place. A co-operation with Alfa Romeo on a joint rear-wheel drive platform was announced in 2012, but cancelled in 2014. FCAannounced a Fiat 124 Spider and Abarth versions based on the Mazda ND platform in 2015. 4 airbags are available for standard including torso airbags, pelvis airbags and head airbags for driver and passenger and headrests for whiplash protection. An Vehicle Stability Control+ (VSC+), an ‘active’ hood for pedestrian protection and a Lane Departure Warning System (LDWS) are available as standard. Since the MX-5 is a two-seater, the front passenger airbag can be disabled for safe transportation of children and the installation of a suitable rear-facing child seat restraint to be used in that position. In the Euro NCAP safety test, the MX suffered from a malfunctioning driver’s airbag, which was unable to prevent the dummy from hitting the steering wheel. It gained 4 of 5 stars available. 50-50 Balance and less than 1000kg ,a Great Deal ! Recently was unveiled the Retractable Fastback version (RF).Mazda isn’t yet talking specific weight figures, but we’re told that the mass difference shouldn’t vary far from that between the previous retractable hardtop and its softtop sibling.That suggests the RF will carry 130 to 150 extra pounds, which we’re hoping is nominal enough.